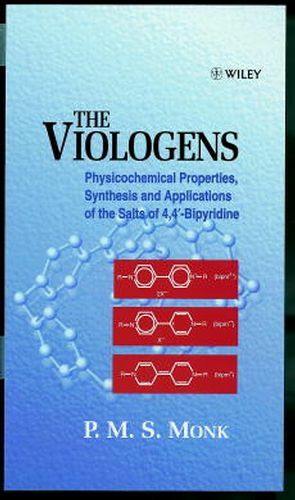 The Viologens Physicochemical Properties, Synthesis and Applications of the Salts of 4,4'-Bipyridine Paul M. S. Monk Manchester Metropolitan University, UK Viologens are salts of 4,4'-bipyridine and are used in such fields as herbicides, electrochromism, solar energy conversion, molecular electronics and supramolecular chemistry. The Viologens is a comprehensive overview of the nature and physicochemical properties of the viologens and details the science behind the applications. Following a broad, discursive and self contained introduction to viologen chemistry, subsequent chapters develop the theory and present a detailed review of the most important properties and concepts in this field. A chapter on viologen synthesis is also included. This book is aimed at researchers in physical and organic chemistry, physics, materials science, biology and environmental engineering. The Di-Reduced Bipyridilium Species: The Comproportionation Reaction. Photochemistry of the Viologens and Solar-energy Conversion. Solid-state Conductivity and use of Viologens in Molecular Electronics.